When Nie Yan opened his eyes, he was back in the outside world. After sweeping his eyes over the nearby buildings, he recognized his current location as Glory City. Why was I teleported here? He noticed a teleportation mark on his wrist which pulsed with a mysterious power. It would allow him to open up a portal and return to Barbarian Kelowitz’s location at any time. However, it was only one-time use. Nie Yan suddenly noticed a crowd of players staring at him in shock. Nie Yan followed their gazes to Zennarde’s Sword in his hand. Gleaming with a gaudy light, its black flames burned fiercely. This was a fire enchanted sword! Even if Nie Yan hid the special effects, the reaction would still be the same. 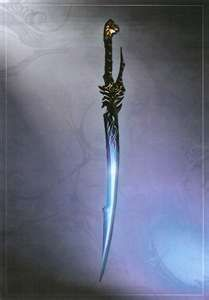 The pitch-black blade was translucent like crystal with a sharp barb curving out from the side. This was the first time they had ever seen such a striking short sword. Nie Yan remained unperturbed by these comments. This wasn’t his first trip to Glory City, nor would it be his last. He strapped Zennarde’s Sword to his waist, then started walking towards the transfer area. 「You’re finally out,」Guo Huai messaged Nie Yan after seeing his current location appear as Glory City. 「We’ve cleared out three strongholds so far, but haven’t yet decided on how to arrange them since we’ve been awaiting your input. As for the others. Holy Empire is in control of two while Victorious Return, Radiant Sacred Flame, and Sapphire Shrine have one each. Bloodlust Blades has already captured five, and both Alliance of Mages and Divine Protectors have three. Meanwhile in Hilderlocke, Battle Crazed Alliance has occupied two,」Guo Huai replied. With great difficulty, Asskickers United had caught up to the middle of the pack. However, since their strongholds were still undeveloped, they were lagging further behind Bloodlust Blades, Alliance of Mages, and Divine Protectors every second. 「Did you watch the video I sent you?」Guo Huai asked. 「Yeah,」Nie Yan replied. It was a video of one of Bloodlust Blade’s recently captured strongholds which was quickly taking shape. With many merchants settling down, business was starting to flourish. Their operations were quite successful. 「We should speed things up on our side too,」Guo Huai urged. Bloodlust Blades was stationed in the neighbouring Glory City. They would definitely be setting their sights on Calore next. It would mean serious trouble for Asskickers United if they allied with Victorious Return and Radiant Sacred Flame! Guilds would generally relocate their headquarters to a stronghold they captured. From then on, their actions would be closely tied to that stronghold. If they failed to defend it, letting the enemy run amuck in their headquarters, the guild would drop by two levels. Asskickers United would have to put up solid defenses to protect their strongholds, especially the one they chose to house their guild headquarters. Later on, if the Dragonsoar Financial Group earned enough profit from Asskickers United, they would invest even more capital into the guild. This would create a continuous cycle that would cement their shared interests; Asskickers United would receive their money, while the Dragonsoar Financial Group would rake in money from businesses they opened in the strongholds. Once that happened, they would be so intertwined that if Asskickers United fell, the financial consortium would also have their supply chains cut off by other corporations. The political atmosphere of the game was slowly taking shape with various factions and alliances starting to solidify. 「I’ll be at the stronghold in just a moment,」Nie Yan said. After capturing strongholds, most guilds would spend their time fortifying them, so war wasn’t likely to break out for the time being. Nie Yan teleported to Calore, then departed the city. Asskickers United’s first stronghold was located on the border of Violet Dream Forest halfway up a mountain. It was perched high atop the land, making it easy to defend. After receiving Nie Yan’s permission, Guo Huai had relocated their guild headquarters here. Nie Yan decided to name the stronghold United City, taking the second word from their guild’s name. Nie Yan rode through the wilderness on horseback. He could see United City in the distance. It was perched high atop a mountain, covering roughly 2000 by 2000 meters. The perimeter of the stronghold was fortified by over 30 meter tall walls. Although there weren’t many buildings inside, he could foresee it becoming a grand fortress city in the future. In the previous timeline, this had been Radiant Sacred Flame’s primary stronghold. It was incredibly difficult to siege, repelling the attacks of Holy Empire time and time again. But in this life, the stronghold had a different owner. Nie Yan planned to make it a genuine impregnable stronghold! Nie Yan rode his Faulkner Warhorse into the stronghold. As he gazed around, he saw a few tattered buildings scattered here and there. Merely used for resting by the previous monster occupants, the buildings looked like a simple breeze could knock them over. All of this would have to be torn down if they were going to remodel this place. There were several thousand guild members guarding the stronghold. When they noticed Nie Yan, they came forth to greet him. Nie Yan gazed up ahead. Several people were walking towards him, Guo Huai, Resplendent Bladelight, Aqua Smoke Stub, and a few others. “You’re here. Come, take a look at the blueprint we drew up,” Guo Huai said. Nie Yan smiled at the group of players, then gazed at Smoke Stub who appeared to be in high spirits. He had risen to Level 45 and was clad in silver armour. “Back to where you were at before?” Nie Yan asked. It seemed Smoke Stub had been doing pretty well for himself. “Yep. With Bladelight, Painted Muslin, and the others helping, I got my gear quality back to what it was before in no time!” Smoke Stub replied with a smile. During this time, the former members of Withered Leaf had slowly raised their strength. Even though they were no longer members of the Tuoba organization, employees with a steady income, they could still accept jobs through the Union of Assassins and earn a decent living. “How’s the financial situation of your new organization? If there’s anything you need, feel free to ask for help,” Nie Yan said. Smoke Stub was already a loyal member of Asskickers United. If he was in a pickle, the guild wouldn’t just stand idly by. “We’re doing okay. After we got some decent gear, it was business like usual. We gave all the money we earned to Wood Grace to invest. We’ve made quite a bit. Right now, our financial situation is already greatly improved. I estimate in the next five or six days, we can pay back our debts in full, then we’ll be back in the black,” Smoke Stub said. After being cleaned out of everything they owned, they didn’t have that much debt remaining, only that all the money they had saved over the years had vanished like a puff of smoke. Despite this, it wasn’t the end of the world. It just meant they would have to start over from scratch. “That’s good to hear.” Nie Yan nodded. He received the blueprints from Guo Huai. It showed where all the various shops, roads, and districts were going to be placed, including the location of the guild headquarters. Nie Yan compared the blueprints with some successful stronghold layouts from his past life, then made a few adjustments. “Since this stronghold is tied to the prosperity of our guild, a single wall won’t suffice. There need to be at least three placed side by side with some space in between them. The gates can’t be located in the same spots either. Otherwise, the enemy can just charge in.” Nie Yan proposed his first change. If the enemy broke through the first gate, they would only run into a wall. They would have to travel a long way to reach the second gate. After breaking through the second gate, the enemy would be met with the third wall, and then they would have to go all the way back around to get to the third gate. Like this, the time it would take the enemy to break into the stronghold would be greatly extended. Large crossbows would be set up on the top of the walls, along with Mages, and the passages between the walls could be filled with Warriors. If the enemy didn’t have siege weapons like catapults or trebuchets, it would be impossible for them to invade the stronghold. “These ideas are pretty creative.” Smoke Stub nodded in admiration. Bladelight and the others also greatly approved of Nie Yan’s ideas. “Furthermore, the transfer point needs to be relocated. Turn the rear of the stronghold into a business district. After all, the Dragonsoar Financial Group is our backer. We need to ensure their benefits inside the game. Also I have a Junior Energy Core from Everlasting City. It can be used to create a barrier for the stronghold,” Nie Yan continued. Like this, the stronghold would be incredibly difficult to lay siege to. After finalizing the plans, everyone got to work. After the Dragonsoar Financial Group’s investment, Asskickers United had ample gold to spare for construction. Nie Yan began remodeling the stronghold. Three walls were erected around the perimeter of the stronghold, each taller than the last. This way, the players on top of the walls could all fire toward the outside. If a fourth or even fifth wall were erected, not only would it be ineffective, it would also reduce the space available for them to use. A towering building was erected at the center of the stronghold. This was the guild headquarters. The transfer point was placed here. It was connected to the guild branch in Calore. If there were any problems, guild members could teleport to the headquarters and quickly provide assistance. Afterwards, a network of streets and paths were built, branching out all the way to the walls of the stronghold. The business district was established in a safe area in the rear. A Tier 1 Siege Machine Factory, Mage Tower, and War God Statue, and a few other structures were constructed near the front of the stronghold. The Siege Machine Factory could make various siege weapons such as heavy crossbows. At higher ranks, catapults could be crafted. The Mage Tower gave Mages a boost in magic power. The War God Statue provided Warriors an increase in attack power, though it was only 3% at Tier 1. In the later stages of the game, there would be even more useful buildings. In addition, there was also housing to take care of. Each house could support a certain number of people. During a siege battle, the number of houses determined the amount of players that could participate in protecting the stronghold. Under Nie Yan’s guidance, rows upon rows of buildings were erected, stretching out as far as the eye could see. Soon there were several hundred buildings in the stronghold. All that was lacking now was people.